While in the process of building or renovating your dream home, the custom window and door options are endless. Depending on the geographical location of your home and the size of your budget, you might be considering wood, vinyl or aluminum options. If you are in the market for a product with minimal environmental impact that is also high performing and low maintenance, aluminum might be just what you’re looking for. Read on for our 4 reasons why you need to choose aluminum for your next project. Aluminum is available in many durable finishes and a myriad of color options. It can also be anodized or powder-coated for extra protection from the elements. As a result, you will never have to have your windows repainted and sealed. Other window and door materials are not as conducive to such durable coatings. Moreover, aluminum offers narrow profile for more view and less bulky material. Aluminum is the preferred window and door material on the market today. It has the durability and weatherproof properties to withstand a range of harsh environmental conditions. Unlike other window materials, it will not swell, warp, crack, or split over time. It is extremely stable in the extremes of heat and cold. 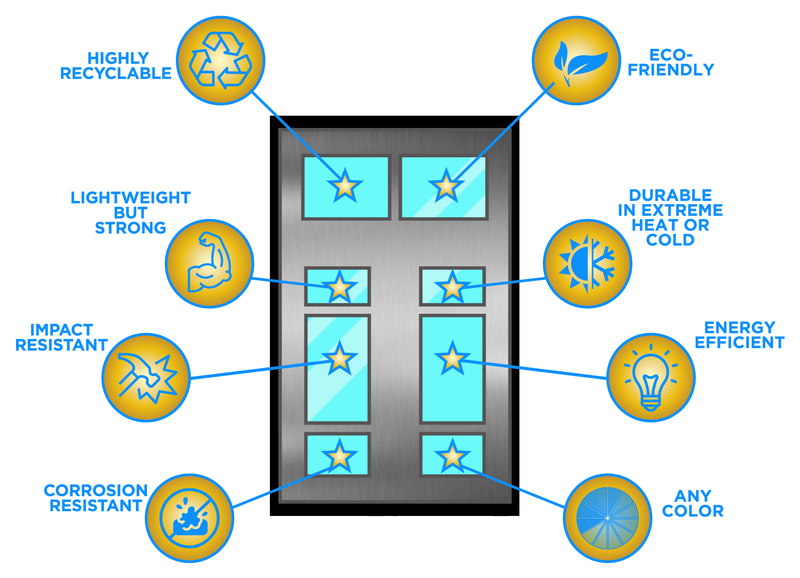 High performance aluminum windows have the capabilities to exceed rigid energy efficiency standards. They are engineered with dual glazing, low-e glass and a thermal break within the framing construction; all of these components combined create a highly energy efficient window that will last for years to come. Manufacturing aluminum window and door products is a very “green” process. Aluminum is an abundant resource that makes up 8% of the earth’s crust. It is fairly simple to mine and unlike wood products, it does not require the cutting down of forests or farm-raised trees in the manufacturing process. Further, this material is one of the most recycled products on our planet. Nearly 75% of all aluminum produced in the U.S. is still in use today. For more information on recycling, click here. At Monumental Windows & Doors we strive for environmental responsibility and recycle 100% of our aluminum scrap. While nothing lasts forever, aluminum windows will last decades longer than their wood or vinyl counterparts.